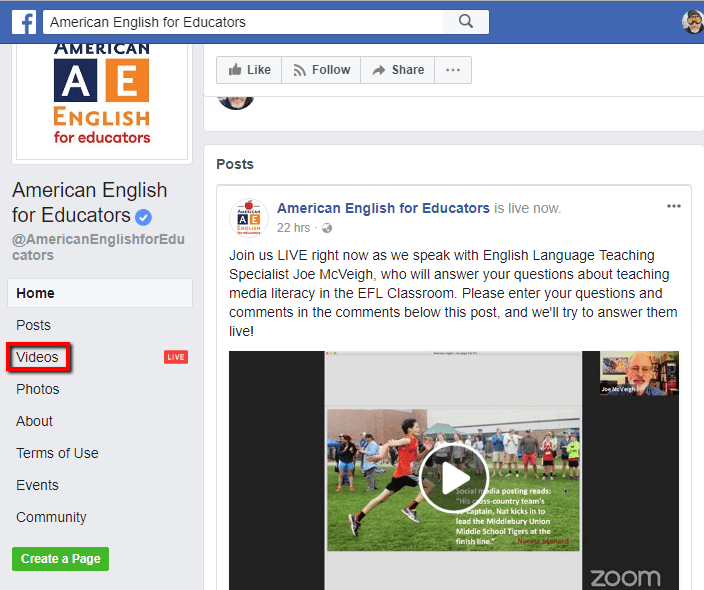 On Wednesday, Oct 11, 2017, Joe McVeigh was “interviewed” by Kate from the American English for Educators Facebook Team, and together they showed us how to put on a professional webinar using the Zoom platform. 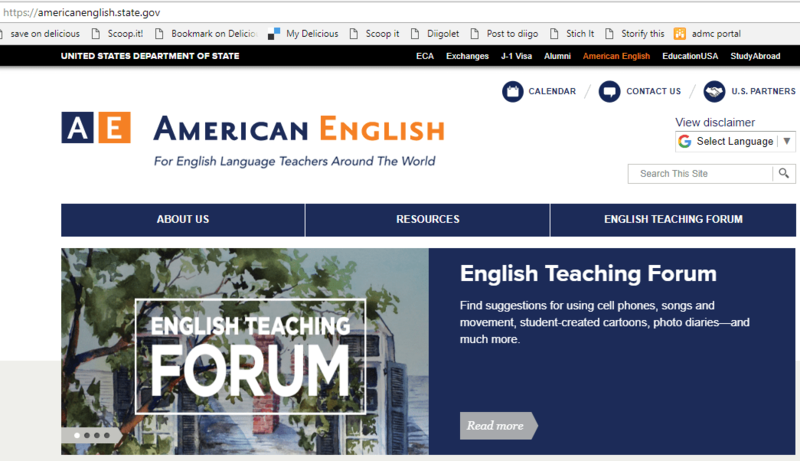 American English for Educators is a US government initiative aimed at promoting American English language teaching. 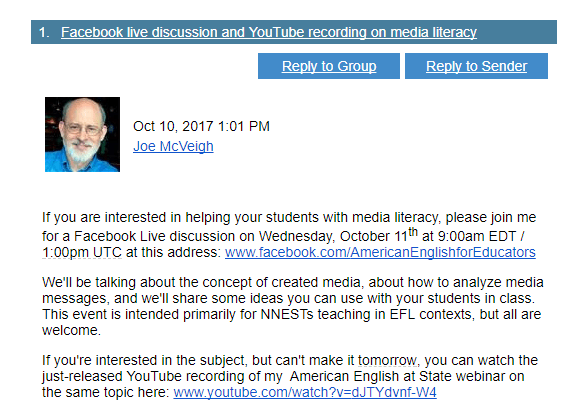 The topic, Empowering your Students with Media Literacy, was timely and of substance, the interview appeared to be well rehearsed and slides carefully prepared, and the language was appropriately simplified for an audience of international language teachers and ESL/EFL learners. The audience checked in from dozens of countries all over the world. Good friend Claire Siskin was there. At the time of the event, the page had a post as the first item announcing that the event would start in 30 minutes, and FB provided a countdown indicating how long ago that was whenever viewers landed at the page. Once the countdown reached 30 minutes, the announcement morphed into a live feed with a play button. Learning2gether went into summer hiatus in August that verged on hybernation, but is now starting to come out of it. Here are events we were tracking meantime. Students, teachers, and organizations will join online to celebrate and demonstrate global collaboration on September 21, 2017. On Global Collaboration Day, educators and professionals from around the world will host connective projects and events and invite public participation. Focus attention on the need for developing globally competent students and teachers throughout the world. Looking to take your school global? Come find out about tools, services, projects, and programs related to globally connected teaching and learning at our signature Global Collaboration Day event. Check out the work of leading global educators, companies and nonprofit organizations at the Global Education Fair, a free, virtual meet and greet for teachers and school districts. The Global Education Fair is modeled after traditional college fairs, but takes place entirely online, allowing participants from all corners of the world to access information about the best global education resources and programs. The purpose of this event is to connect educators to companies and organizations working in the global education space. There is a nominal fee involved for non-profits and companies seeking to present at the Global Education Fair. Educators who want to pitch specific projects can present for free. Global Collaboration Day has arrived! One day, September 21st. all around the world = 48 actual hours to share. (Except that we’ve got events even beyond those time boundaries… so maybe this is Global Collaboration “Week?”) Plus, the Global Education Fair (10:00 am – 8:00 pm US-Eastern Daylight Time) is almost here!Over the next two+ days, students, classrooms, teachers, administrators, parents and organizations will be either attending and/or hosting events online that are designed to showcase and promote global collaboration. We (Lucy Gray+ Steve Hargadon, co-chairs of the Global Education Conference) are the calendar coordinators but not the direct conveners: that is, over 75 groups from 25 countries have designed and planned their own events which we have then organized into a directory and in special calendars to allow these events to be seen in any time zone in the world. The third-annual Global Collaboration Day is a huge worldwide demonstration of the power of globally-connected learning. We encourage you to browse the event directory or the calendar and choose a compelling event to attend! Read directions and our website carefully to prepare. A current list of the events is at the bottom of this post. Special thanks to Participate, our sponsor. 6:00pm FAIR EXHIBITOR: Plastic Pollution. How Can we Go and Save Greener? 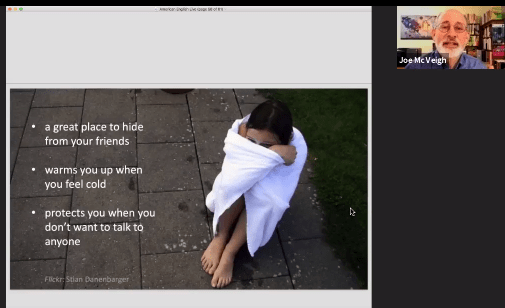 7:00pm GCD: Global Collaboration – Let’s talk Tools! Let’s talk Learning Design! 8:00pm GCD: Plastic Pollution. How Can we Go and Save Greener? Event description: The session aims at sharing engaging online tools that will help teachers to boost creative approach to writing, storytelling and have fun collaborating online. There will be several EFL teachers from all around the world who will show how to use the tools and share their stories. allow to use the cam and mic when prompted. “Spark Creativity in Your Classroom with Adobe Spark”We are so excited to welcome Suzanne Sallee as our special guest presenter for this webinar “Spark Creativity in Your Classroom with Adobe Spark.” We have had many presenters who have shared in previous webinars about Adobe Spark but Suzanne plans to drill down on some amazing features that you may not have discovered. On the Classroom 2.0 LIVE! site (http://live.classroom20.com) you’ll find the recordings and Livebinder from our recent “A Guide to Writing a DonorsChoose Project and Getting it Funded!” session with Francie Kugelman. Click on the Archives and Resources tab. “Featured Teacher: Michael Foster”Our Featured Teacher shows are always really special, and we always look forward to hearing about the amazing things teachers are doing with their students! We are so excited to welcome Michael Foster as our Featured Teacher this week. His presentation will center around connecting with peers to refresh lesson ideas. He will share story-based examples and how the same lesson ideas can be reimagined without brain damage. Mike and his family live in northern Colorado where they enjoy community outreach with several non-profit organizations. (This has resulted in a menagerie of animals in his household and connections to a rainbow of local connections that benefit children outside of school. On the Classroom 2.0 LIVE! site (http://live.classroom20.com) you’ll find the recordings and Livebinder from our recent ”Breakout EDU Game Design” session with Patti Harju. Click on the Archives and Resources tab. You can attend the mini-conference live or you can watch the recordings at any time afterwards. When you register, according to the announcement, you will be sent a bonus “Library Makerspaces” Resource Pack, and you’ll receive an exclusive invitation to a 90-minute pre-conference event hosted by the team from the Fayetteville Free Library: “STEAM and Making at the FFL.” Plus, we’ll be using BadgeList.com so that you can receive digital credentials for attending and participating! The recordings of the keynotes and the sessions are now available! You can aslso subscribe to the main Library 2.0 YouTube Channel: https://www.youtube.com/c/Library20.